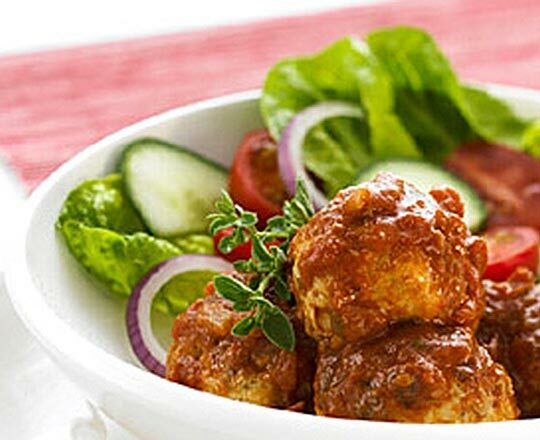 Deliciously tasty meatballs great served with salad, steamed vegetables, or rice. Mix together the chicken mince, Philly*, onion, garlic, egg, breadcrumbs, olives, oregano and seasonings in a large bowl until well combined. Shape mixture into 24 balls. Heat oil in a large non-stick frying pan over medium-high heat. Cook the meatballs in 2 batches, for 5 minutes each or until browned. Return meatballs to pan along with tomatoes, stock and sugar. Bring to boil, then simmer, uncovered, for 15-20 minutes. Spoon the meatballs onto serving plates and drizzle with sauce. Serve immediately with salad.